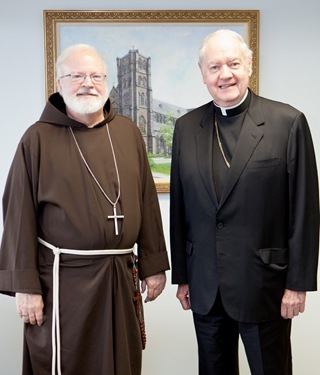 Last Thursday, we were pleased to have a visit by Cardinal Edward Egan of New York. Cardinal Egan was here to preach at our retreat for senior priests. 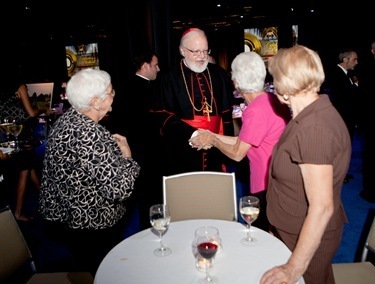 He stopped by to see the new Pastoral Center and to have lunch on his way back to New York. I know the priests were all very enthused and grateful for the retreat that he preached. 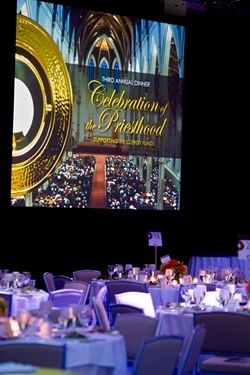 That evening, I attended our 3rd annual Celebration of the Priesthood dinner. 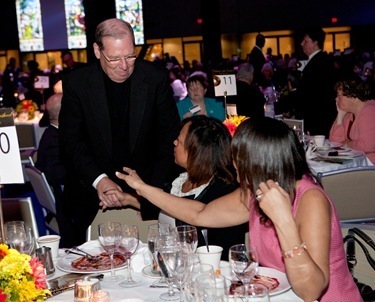 We were all very gratified that 1,100 people came together to help us to honor our priests and to raise funds for the Clergy Funds. I was very impressed with the video that was shown, which featured five of our priests in the archdiocese, each with a different story. And I was also very impressed by the talk by Chris Boyle, who is a theology teacher and coach at Catholic Memorial High School in West Roxbury. He gave an extraordinary witness of a young Catholic talking about the importance of priests in the life of his family and his own life. During my remarks, I shared that I have been asked some interesting questions by children over the years. 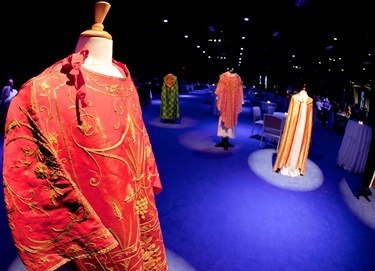 I said my favorite encounter with a youngster was when I was asked “Are you the communion guy?” And I think this is a great description of the priesthood. 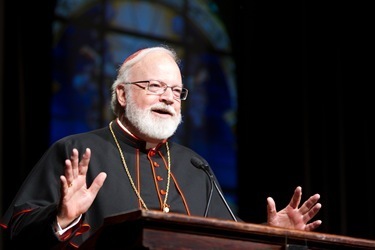 As I said at the dinner, not only is Communion in the sacrament of the Eucharist, the center of our existence as Catholics, but there is also the communion of the unity of Christ’s family in the Church, that is our connectedness to God and to each other. 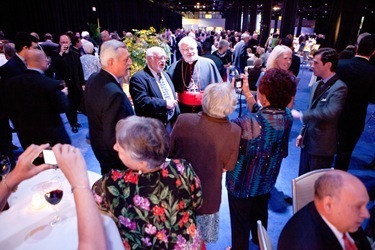 And priests and the laity depend on one another, so it was a great evening altogether. 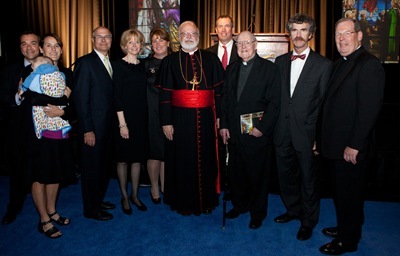 We are grateful to all of those who helped support the Clergy Funds. After a few worrisome years, the fund will be in the black next year, and that is very important. 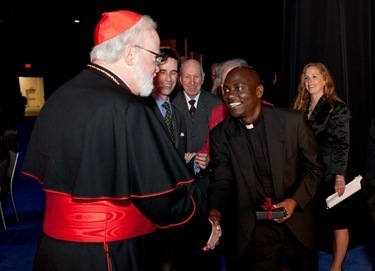 We want to be able to take care of our priests in their own old age and infirmity and this fund enables us to do that. 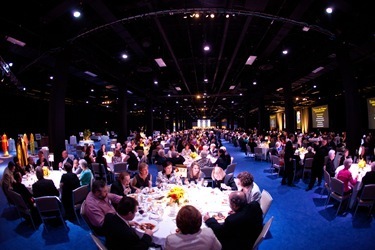 So we are grateful that people have recognized this and were very generous in supporting this cause— the dinner brought in over a million dollars. On Friday, I met with the Italian Consul and Father Antonio Nardoianni, the Franciscan pastor of St. Leonard Parish in the North End. The Italian community is planning celebrations locally, as Italians are throughout the world, for the 150th anniversary of the state of Italy. And they came to speak to me about it and invite me to be part of the celebration that’s going to be held on October 9 in St. Leonard’s. 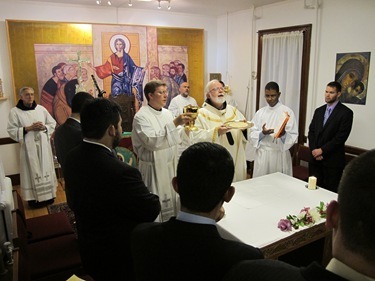 As each of the seminaries begins the year with a Mass invoking the aid of the Holy Spirit, that evening I went to celebrate the Mass of the Holy Spirit at Redemptoris Mater Seminary. It was also the feast of St. Padre Pio. 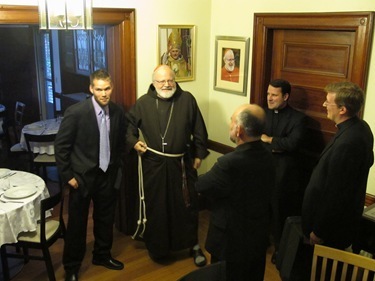 I was happy to greet one of the new seminarians, Nick Thompson, originally from Minnesota. Another three are on their way after they were invited to come to our seminary a couple of weeks ago, at an international gathering organized by the Neocatechumenal Way in Porto San Giorgio, Italy. 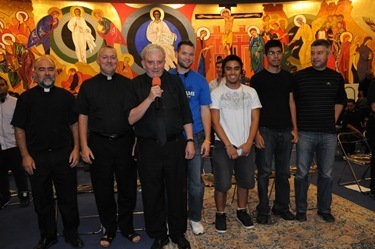 These young men responded to God’s call to the priesthood as they were participating in the life of their local Neocatechumenal communities. 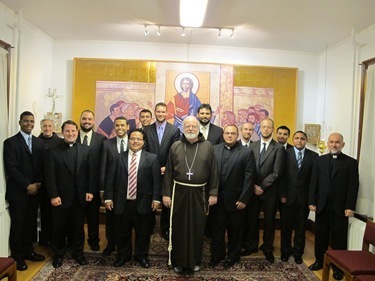 Their call is both diocesan and missionary so they are willing to go to be formed, and eventually incardinate themselves in, any diocese with a Redemptoris Mater Seminary like ours here in Boston. 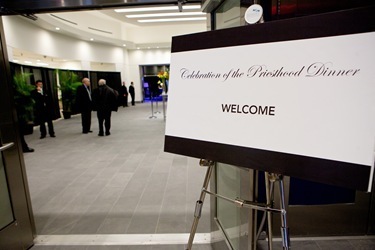 I have participated several times in those gatherings, but this year I was unable to attend so I asked our Vicar for the Clergy and Parish Life, Father Tom Foley, to represent me there. 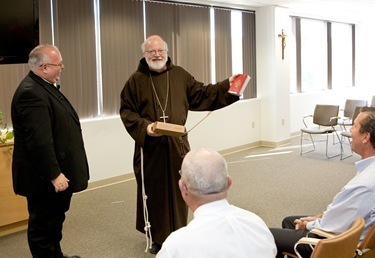 On Saturday, we had our first meeting of the year with the Massachusetts Catholic Conference, which included the four bishops of the Massachusetts along with representatives from the various dioceses. The new staff members of the MCC were there: executive director, James Driscoll, and associate director for policy and research Peter McNulty. Of course, among the very important issues that we discussed was the initiative to legalize physician assisted suicide. 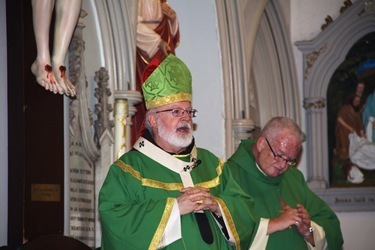 Plans were made to initiate a response on the part of the Church, and a committee is being set up with representatives from the four dioceses. Jim Driscoll also announced that the MCC is working on launching a newly redesigned web site, which will be a great aid in our efforts at outreach and education on this and other issues. If you missed my post last Friday, I want to point you again to my remarks on the issue. On Sunday, I visited Most Holy Redeemer Parish in East Boston. The pastor Father Tom Domurat invited me to celebrate the Spanish Mass there. This parish has one of the largest Mass attendances in the diocese, and, not surprisingly, the church was packed. 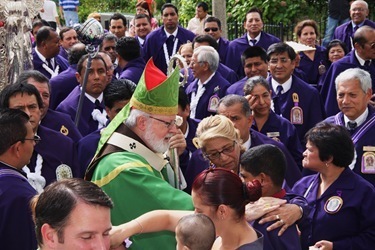 We were accompanied by many members of the Hermandad del Señor de Los Milagros in their purple outfits. They represent the Peruvian community, which was beginning their week long celebrations in of honor the Lord of Miracles, which is a very famous image of the crucifixion in Lima. I once visited the convent where the original image is kept. It was painted in the 17th century by an unknown slave on a wall of a building where they were housed. One day there was an earthquake, there was great devastation and the entire building collapsed, except for the wall with that painting. When the people saw the image still standing in the midst of the ruins, they developed a great devotion to the image. 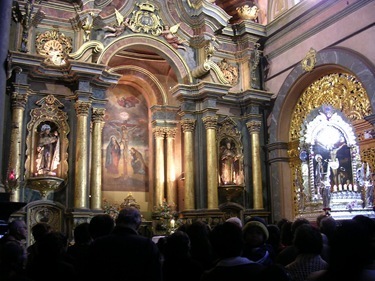 Later, when a second earthquake devastated Lima, the image was reproduced onto a canvas and carried in procession through the city. The tradition has carried on for centuries of carrying the image through the streets of Lima in October. About two million people participate, many dressed in purple, burning incense along the way. I have never been fortunate enough to be there for the celebration but I have seen pictures of it. When I was in Washington for 20 years, I had the celebration there with the Peruvian community, so I was aware of the origins of the feast. 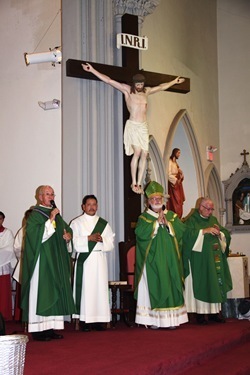 I told the people at Holy Redeemer the story about how after I had left, the Capuchin friar who took my place in our church, Sacred Heart, started preaching his sermon about Nuestra Señora de los Milagros (Our Lady of the Miracles). 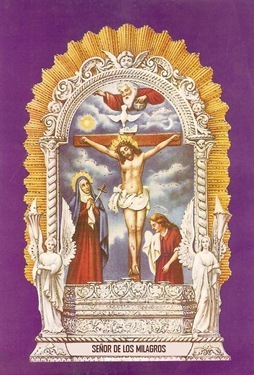 Because, of course, the image is of Calvary which includes Our Lady. He was so used to having all of the Marian feasts, that he thought this was one more! Then also at the Mass, I gave a special blessing to those involved in the St. Vincent de Paul Society who are very active in the parish. Father Al Keenan, who is a retired priest in residence there, also accompanied us. There are some great things going on at Sacred Heart, which is a very active parish. 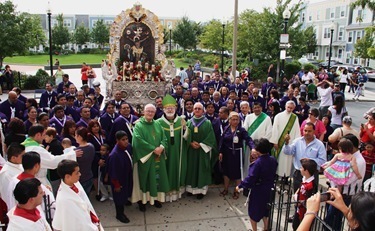 This was Bishop Robert Hennessey’s former parish and, in fact, he is coming back next week for the feast of El Señor de Los Milagros itself. 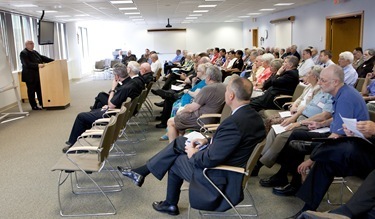 On Wednesday, I attended a presentation with a large group at the Pastoral Center given by Msgr. 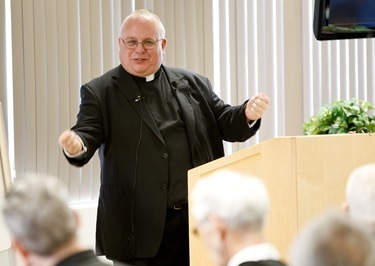 Andrew Wadsworth, the executive director of the International Commission on English in the Liturgy, better known as ICEL. 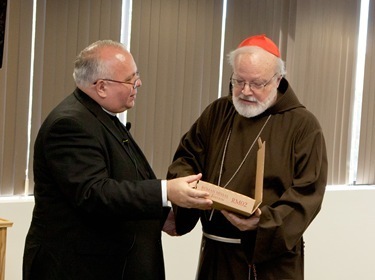 In the evening, he also spoke at St. John’s Seminary. He gave a talk on the new translation of the Roman Missal that will begin being used on the first Sunday of Advent. He has been very much involved in the translation. He is uniquely equipped with his background in theology and language to do this, and we’re very grateful for his work. He gave me the new Missal, the one that has been published by the Catholic Truth Society out of London that has explanatory notes. This edition is unique in that it is the first edition of the new Missal to be printed in a smaller format. We are grateful to Msgr. 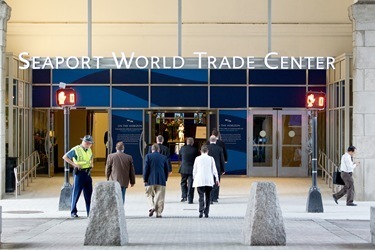 Wadsworth for making time to share his insights and expertise with us here in Boston and we are pleased that so many came out to take advantage of his talks.